“Simply giving and not taking is a wonderful thought to live about” these wonderful lines are said by great person Swami Vivekananda. Having a thought of return ruins of some good deeds done in your life. Very few people in this world have enlightened the thought to only give and do not expect anything in return, termed as selfless giving. Dots at Multidots too believe and indulge in the joy of sharing and giving. Being with the ones who need more love and concern is actually a thing of joy. Every one cares to be with their family during their leisure time. But being with others and making ourselves a part of the society is something every individual must do. 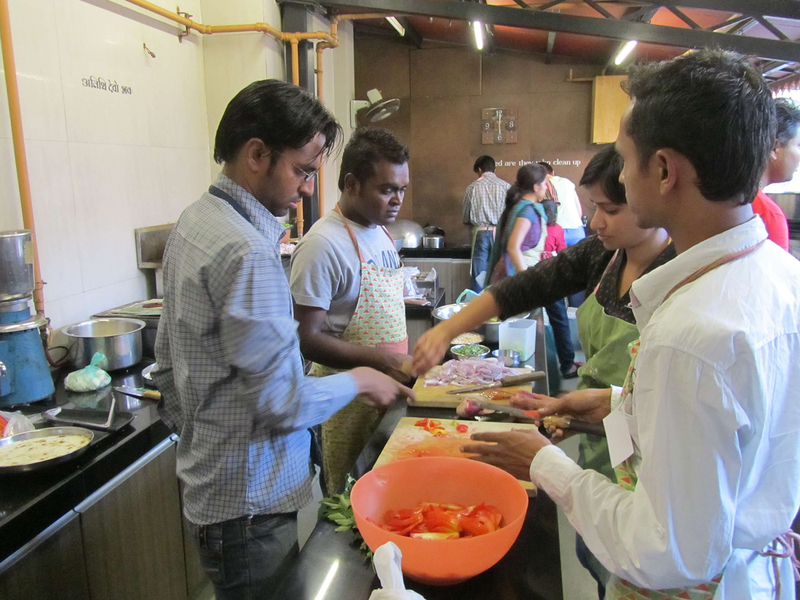 Dots planned a “Joy-Giving” event by going at Seva Café and spending quality time preparing and serving varied dishes to guests happily and selflessly, and living the culture of Seva Café for a day. 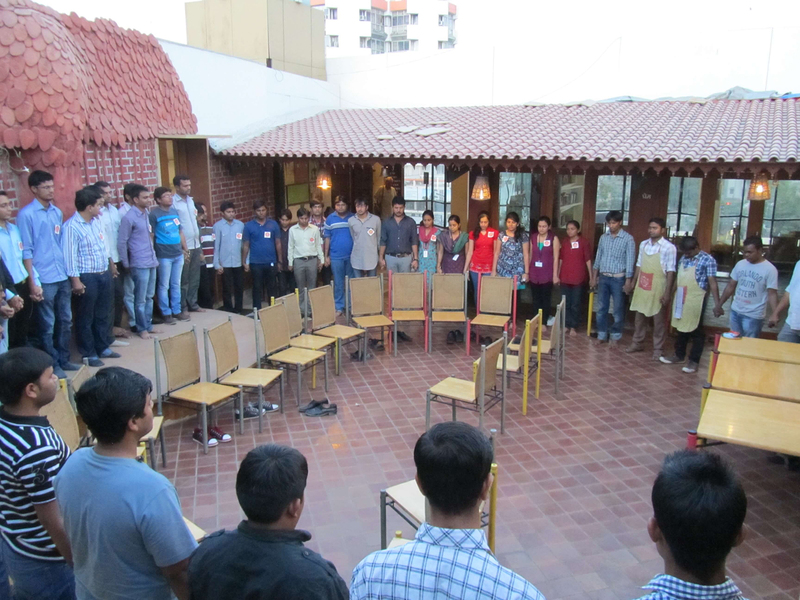 The dots were welcomed with “Tilak” and “Aarti” by Seva Café members. This, along with the traditional music, recollected the glimpse of welcome party organized by the dots for the trainees / new dots at Multidots. On Saturday, 30th March the enthusiastic dots involved themselves to work prominently with members at Seva café while playing activities and also some cleaning work. Joining hands for good cause has always been in culture of Mutlidots team. 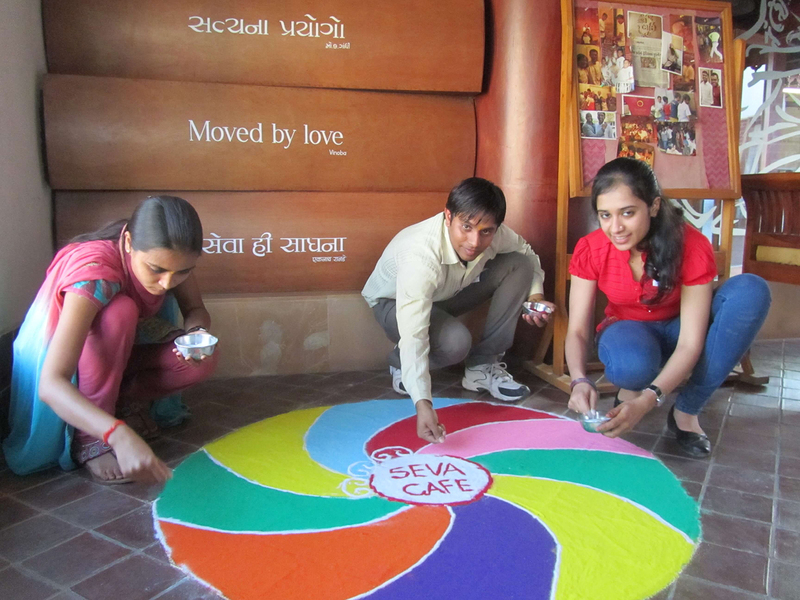 Playing with colors comes from the list of most preferred and enjoyable tasks, so dots together had fun creating artistic shaped Rangolis at Seva Café entrance. All the dots mingled with Seva Café members and volunteers and filled the evening with fun and wonderful colors! The Dots joined the volunteers in preparing food and serving the guests with dinner, as they arrived from around 6 in evening. 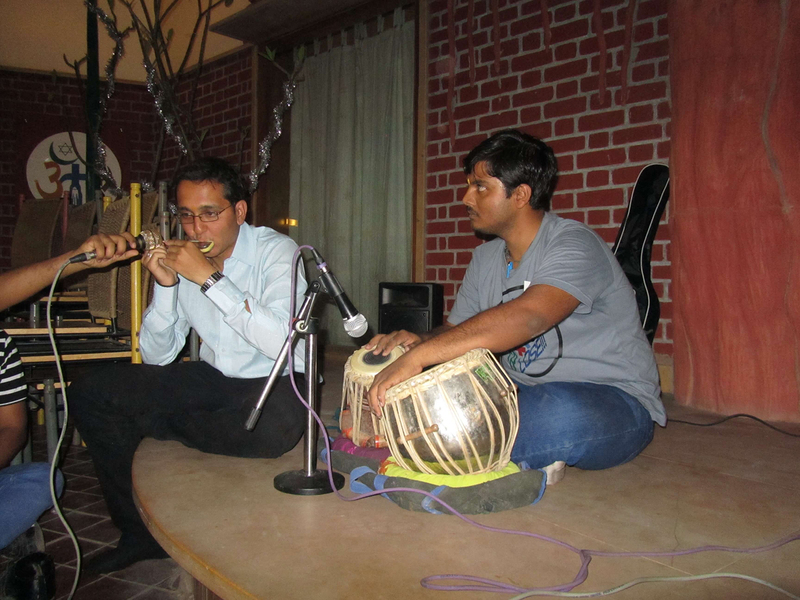 While guests were enjoying dinner, some of our dots showcased their talent, where one of the dot Bhavin played Tabla and another dot Pratik played guitar and mouth organ, entertaining everyone present there. 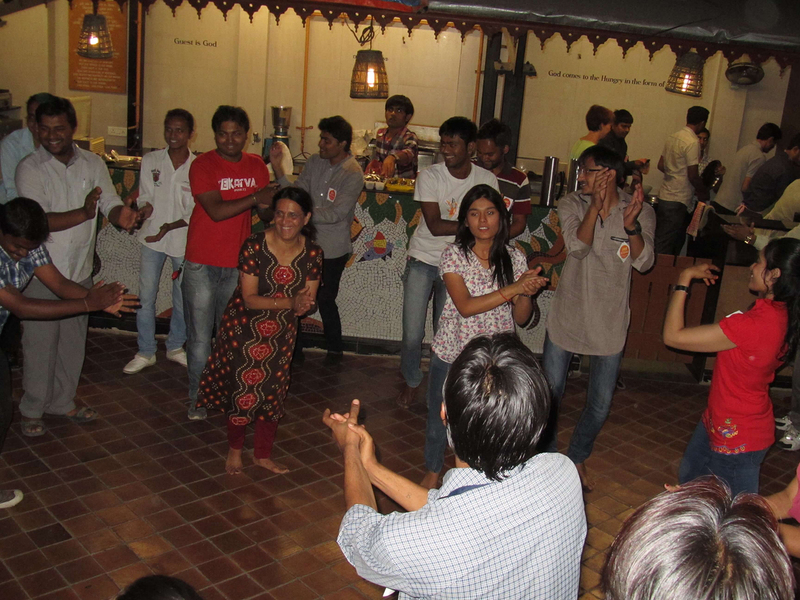 After all the dots enjoyed dinner with members at Seva Café, there was an impromptu Garba round that some dots started with some members, and gradually all joined them in that joyful event. Then there was also one very interesting event where every dot was asked to pick up a card randomly from a pack of cards, and on every card some social service activity was written which the card picker was supposed to do within one week. Those were small but interesting social activities. Seva Café has few exceptional traditions and events, which impressed all the dots. Daily evening prayer holding each-other’s hands, exchange gift table, exchange library, gift carry-forward system, open donation box and few more things which presented the good aura of Seva Café. For books and things including clothes, it can be kept at open table as part of your contribution. Apart from this, you may even collect any book which you find interesting while putting in place another one from your end. It costs nothing as Seva Café has been doing his for the betterment of the society with selfless purpose. This culture is adopted by people living in towns and mega cities, and also groups of non-profit and NGOs visit villages and under-developed areas in different states and countries to assist them in growing and living substantially well. Apart from the hectic life of city, these people form volunteer groups to educate children and make them aware about the forgotten birth rights. Belief of togetherness as the key to happiness with no expectation in return, would take your soul to great heights and gratitude. This mantra is implemented rigorously by Dots while making the society a place worth living in. 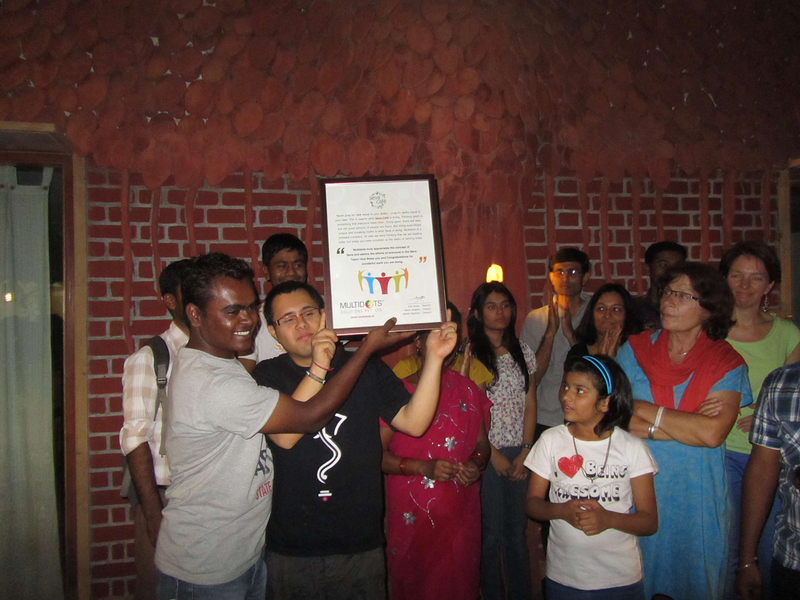 Seva Café was quite overwhelmed when Multidots gave them “Certificate of Appreciation” as token of appreciation for what they are doing for the society and mankind. Multidots have been participating in social causes by organizing such events, thus realizing the importance of CSR. This event by Multidots was a small initiative where they decided to involve with society, and take pleasure in fulfilling their responsibility towards society. It was a great fun observing and experiencing a rarely found blend of different cultures across the world gathered at one place, serving a common and noble cause.